What you think about is a choice – it may not seem like it, but it is. You may believe you “can’t help it”, these negative thoughts keep spinning, and you are right – in the past you have been pulled and swayed by the gamut of thoughts swirling around in your mind. You may have been knocked over and taken out of the game by these thoughts – they are powerful, and they may even be true…but they are not supportive, and they can be changed. I forgive myself for believing it is hard to change what I think about. I give myself permission to consciously and proactively train my subconscious mind to be on the “up-side” of the line. I choose to develop positive thought as a new habit. I am free to change my thoughts – they are mine! I know what it is like to change my mind to happier thoughts – I did when….. I am actively learning to shift my thoughts to the positive. 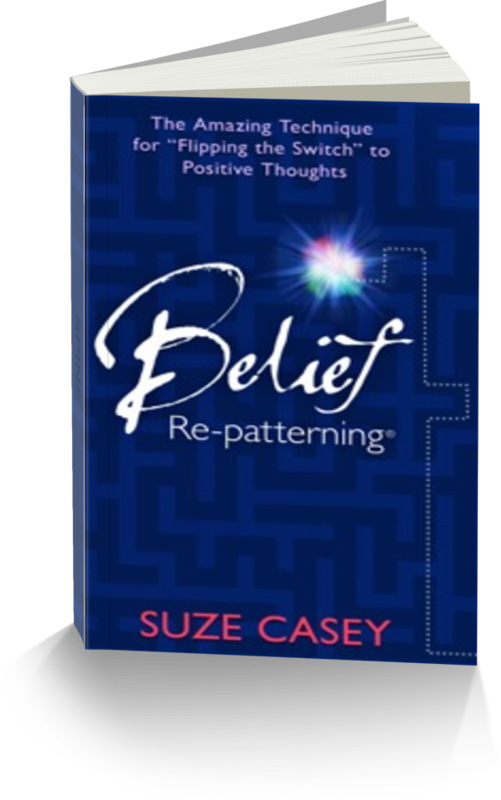 With any story, there are many starting points, and the journey that led to the creation of Belief Re- patterning was a series of experiences and resulting awareness that came together over time. That summer I attended a Bob Proctor Round Table event. Bob is a well-respected, internationally recognized motivational speaker. I felt honored to be in the audience. Bob encouraged us to be “vigilant” with our thoughts “at all times.” It was a great idea, and as I wrote it down, I began to wonder how I could get the same positive results in an easier and more loving way; being vigilant felt hard and punishing. I had become frustrated with suggestions that I just change my thinking. That was the exact part that challenged me, and it seemed to me that books and workshop leaders just glossed over it. I knew it was important to keep my thoughts positive, but how could I do that without feeling like a fake? How could I be vigilant at all times, when my subconscious was in the driver’s seat many more hours than I was able to be aware of my thoughts? Why did it have to take so long? Bob’s thought-provoking comment triggered a deep investigation. Could I develop a way to train my subconscious mind to keep my thoughts positive? Was it possible to reset my autopilot settings and sustain those positive settings so that the Law of Attraction would always manifest in the direction of what I truly wanted? What if I consciously developed powerful neural pathways that would support my subconscious mind to switch my thoughts? After I started experimenting and sharing, refining and realizing, and compiling and creating, I began writing down and tracking my discoveries. I did not need to be vigilant at all times. I discovered that I could proactively train my subconscious mind to do it for me, and it was happening quickly and easily. From the Preface, p. xxiv Belief Re-patterning: The Amazing Technique for ‘Flipping the Switch’ to Positive Thoughts. I love supporting others in learning to proactively shift their mindset – shall we explore this together?